Axis Of Oversteer: Racing at Le Mans and the Nürburgring in the same seven days. 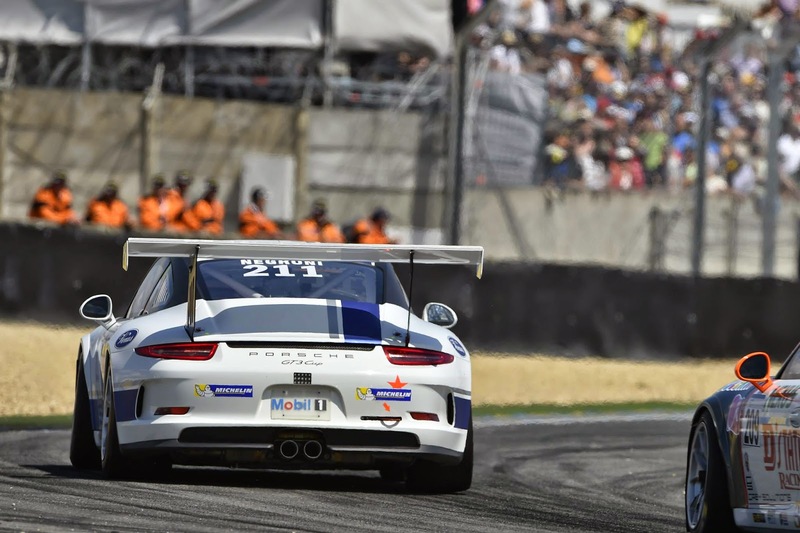 Racing at Le Mans and the Nürburgring in the same seven days. 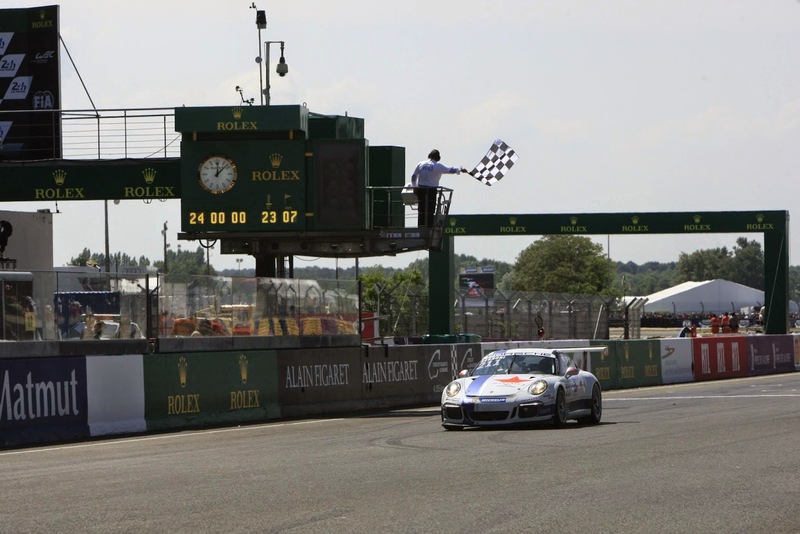 Imagine racing sports cars on two of the world's most famous race tracks, in two of the wold's most prestigious events in the same week. 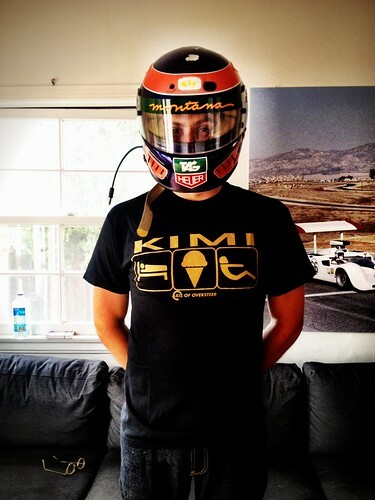 A number of elite professional drivers have dome it but not too many "gentlemen" have. Lucky for us, we have an inside line. 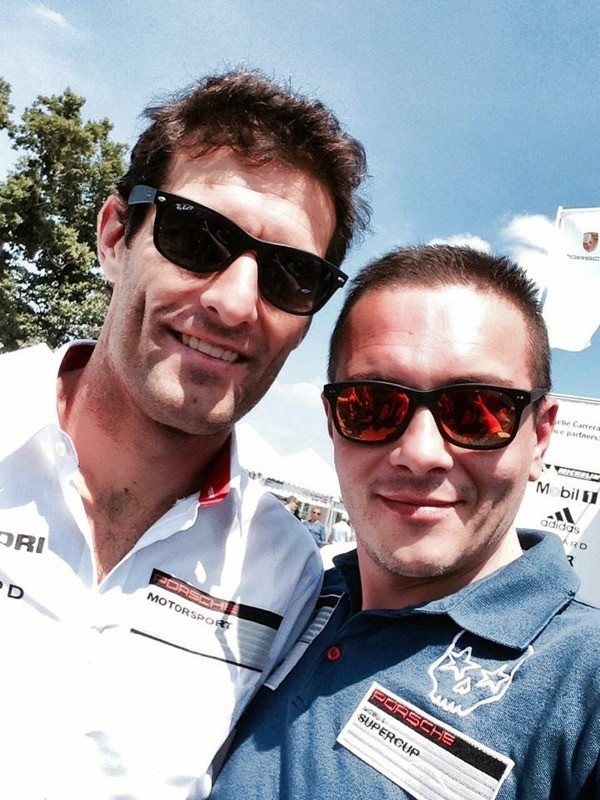 In the same week in June of this year, Sergio "Sergini" Negroni took the green and checkered flags in the Le Mans Porsche Carrera Cup race in support of the 24 classic and then was off to the Nürburgring for the 2014 ADAC 24 Hr Rennen. An amazing experience Sergio agreed to share with Axis. Negroni is an enthusiastic and capable "gentleman" driver from Bologna. 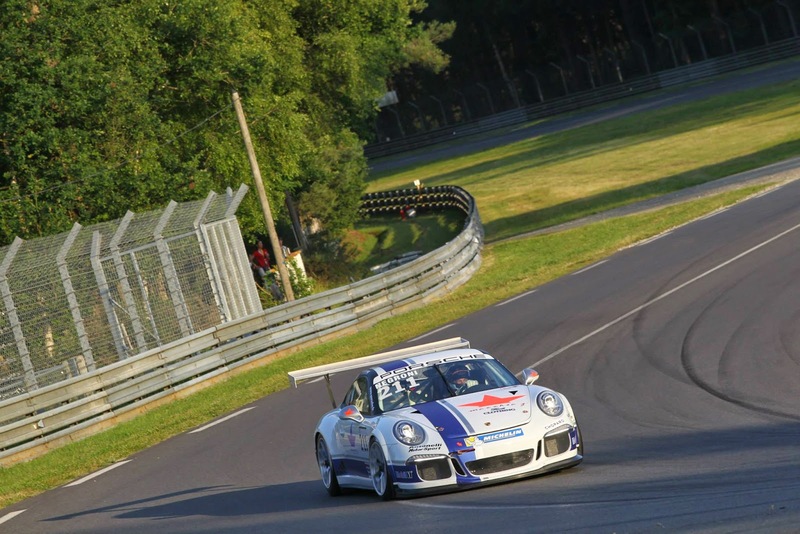 He has competed in multiple 24 hour races at Spa and the Ring as well as national and international events, mostly with Porsches. In fact you could fairly describe Sergio as a rabid "Porschista". 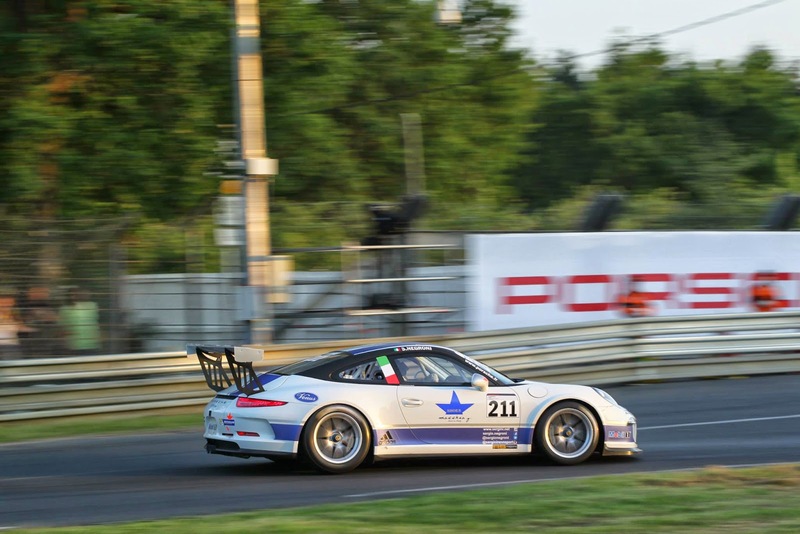 In his piece he touches on the differences between the 997 and 991 generation race cars, the 991 was just released to the general race customer public for the 2014 season so it should be of particular interest to some of you. Oh and today happens to be his birthday...so happy birthday Sergini! June: the Month of Awesomeness! After a number of busy years racing, my plan for 2014 was to race less but at a higher events. 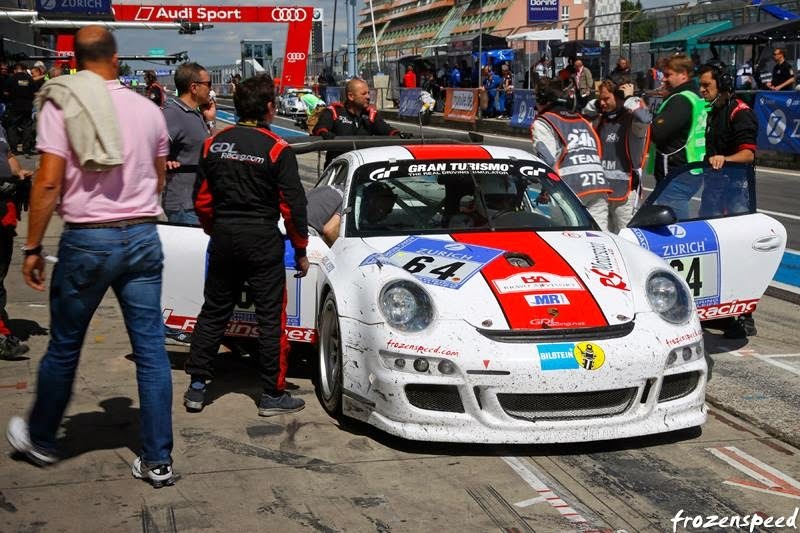 That's how I decided to enter the big Carrera Cup race in support of the 2014 24 Hours of Le Mans and the following week end, the 24 hours of the Nürburgring. It was so cool to see some of the same faces at two such different tracks. 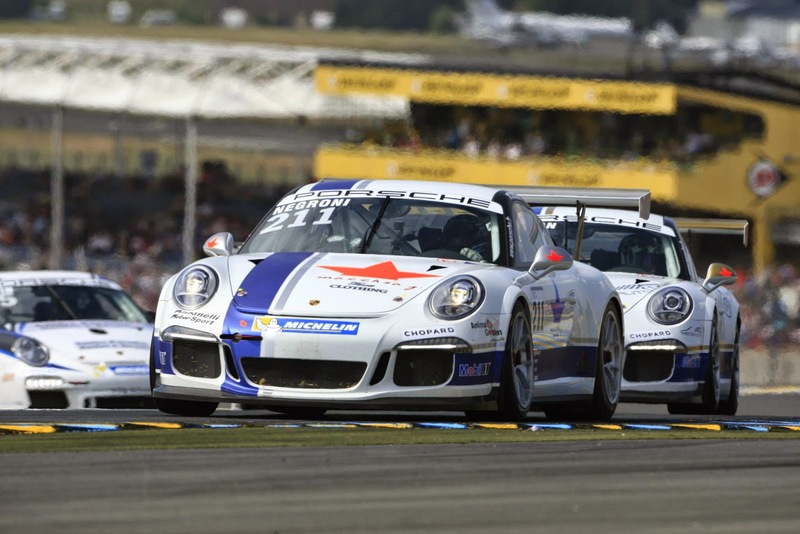 At Le Mans, I was racing a 991 GT3 Cup with Antonelli Motorsport, a top team in both Porsche Supercup and Porsche Cup Italia. It's a team I know well, from my hometown of Bologna. The 991 is a completely different machine from the outgoing 997. Its longer wheelbase makes it much more stable mid corner and the wider tires help speed both in corner entry and exit. The engine is the same in both cars (you can barely feel the extra 10 HP of the newer model) but the much improved traction of the 991 allows you to get on the power sooner than the 997. What's changed the most are the brakes. 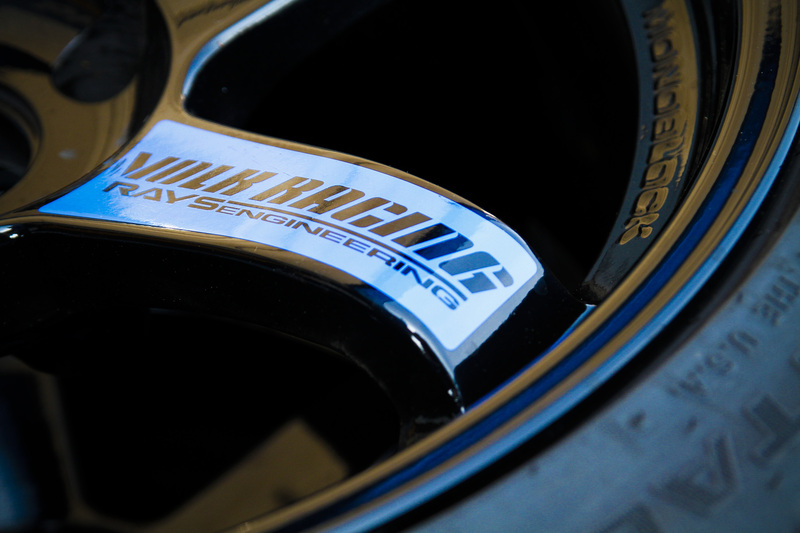 On the 997, pedal travel was very short and that made it difficult to modulate pressure and not lock up tires. The 991 still has no ABS but travel is longer and the action is more boosted. the result is a more friendly and effective system, and less flatspots. The new gearbox on the 991 is fantastic: it's very quick both up and down and has over rev protection. 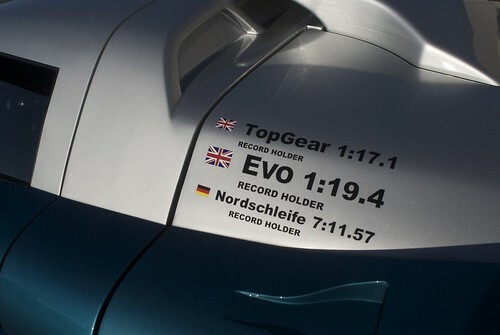 On the 997 it was very easy to damage the gearbox or even blow the engine. The schedule for Le Mans gave us a one hour practice, one of qualifying and a 45 minute race, just a head of the main event start. 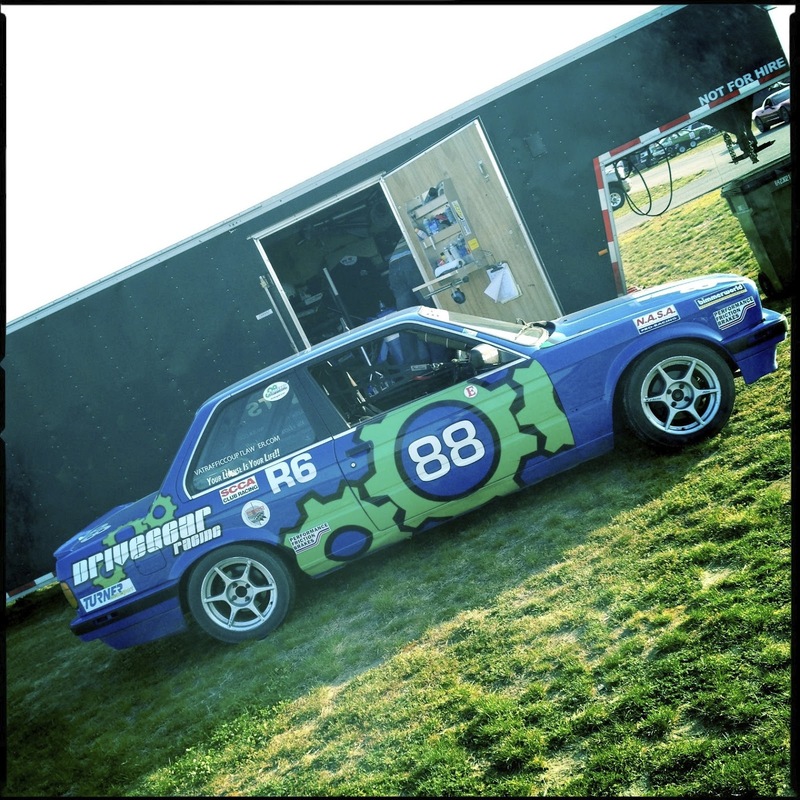 My confidence in the car grew lap after lap, I braked later and powered out of corners sooner. Braking for Mulsanne and Indianapolis is especially tricky: they look straight but they are actually on a kink which makes locking wheels easy. 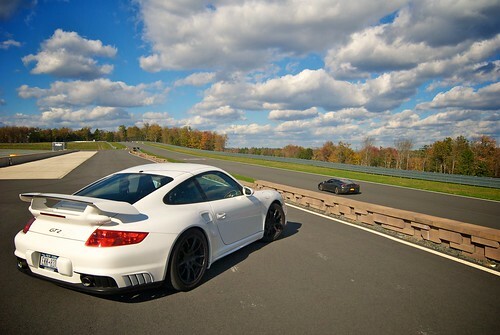 Turn in for the famed Porsche curves is a major pucker moment. 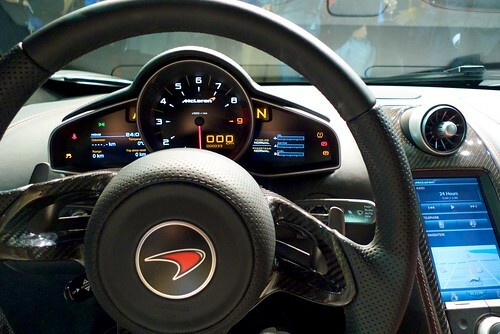 You approach full throttle in 6th gear at about 270 km/h, 170 mph. To do it right you have to be right on the edge of the grass on the right, brake all crooked, come down a gear and turn in full throttle in 5th. I have never driven a corner as fast, Monza feels slow in comparison. The two chicanes on the main Hunaudieres straight are quite fast and technical as well. 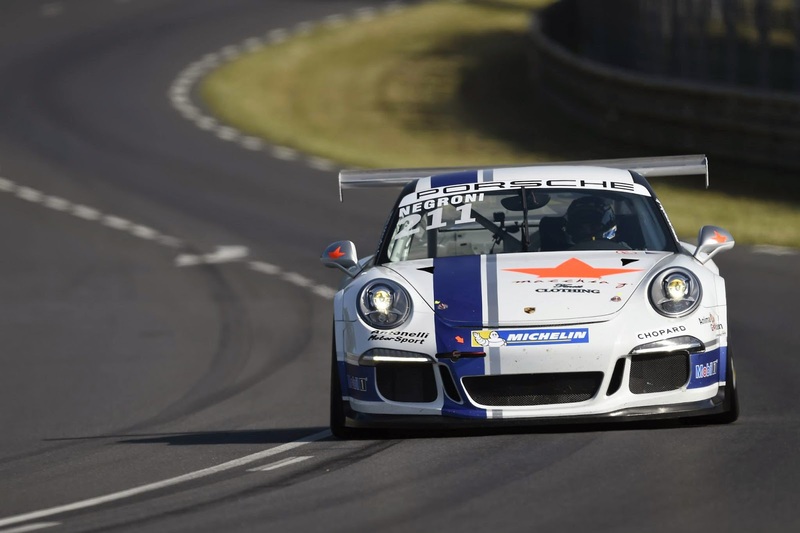 I finished 35th and was very happy especially considering that the world's top Porsche drivers, Estre, Bamber, Barker, Aiello were in the race. 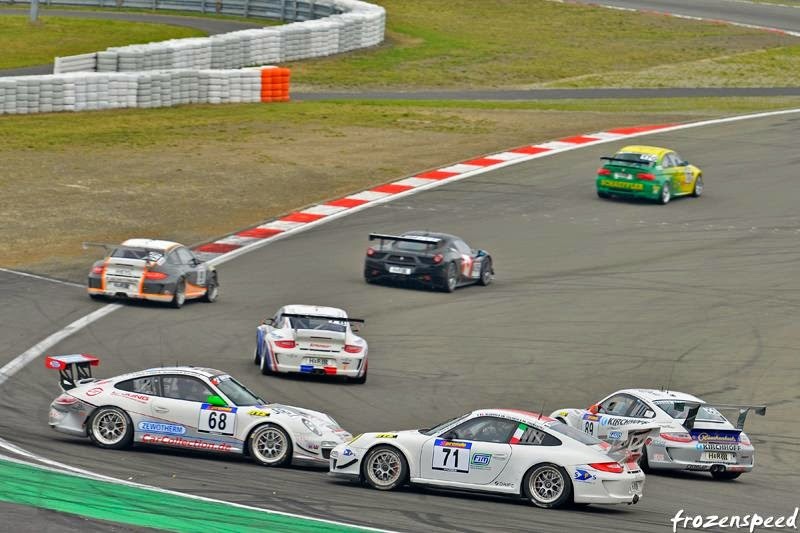 Towards the end, the car lost some speed and picked up some oversteer in the fast turns. In the post race debrief my team explained we had started with higher than normal pressures to avoid problems with tire explosions. A number of my competitors had just that happen in the later stages so a big hand to Antonelli, it's this kind of attention to detail that separates the top teams from the rest. After the race we were able to relax and as guests of Team Porsche we had all access passes and could go more or less wherever we wanted. 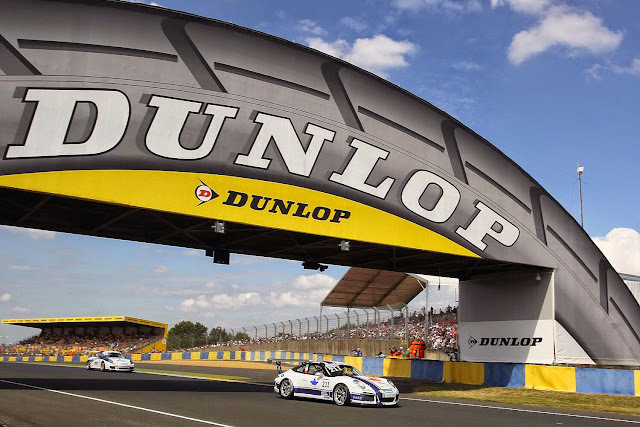 Watching LMP1 cars at night between the Dunlop bridge and Tetre Rouge was insane, they were like slot cars glued to the ground while GTE cars were able to of full throttle in sections GT3 Cup cars could only dream of doing. Amazing how low to the ground the Porsche 918 Hybrid is, Sparks shooting out from its titanium skid plate as it pounded the curbs at the "essex and at Tetre Rouge without ever losing its composure. 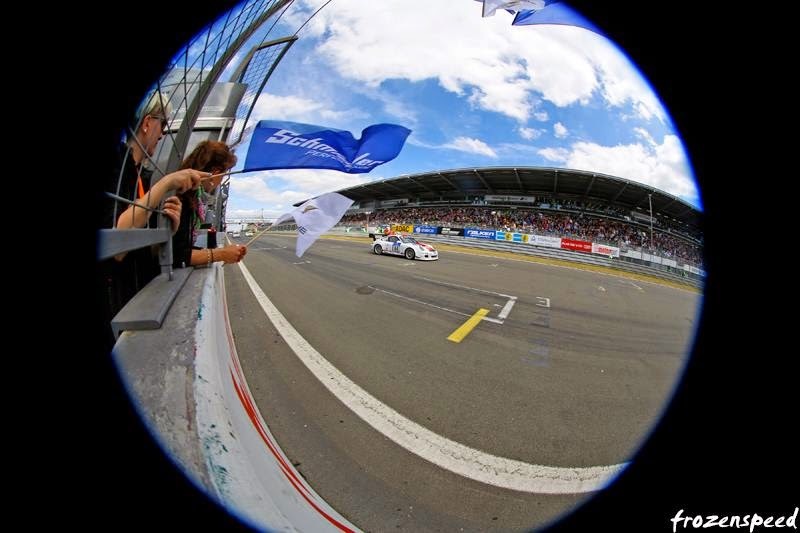 Two days after the thrill of Le Mans, I was ready for the next: the 2014 ADAC 24 H Rennen. It would be my 7th time at the German classic. 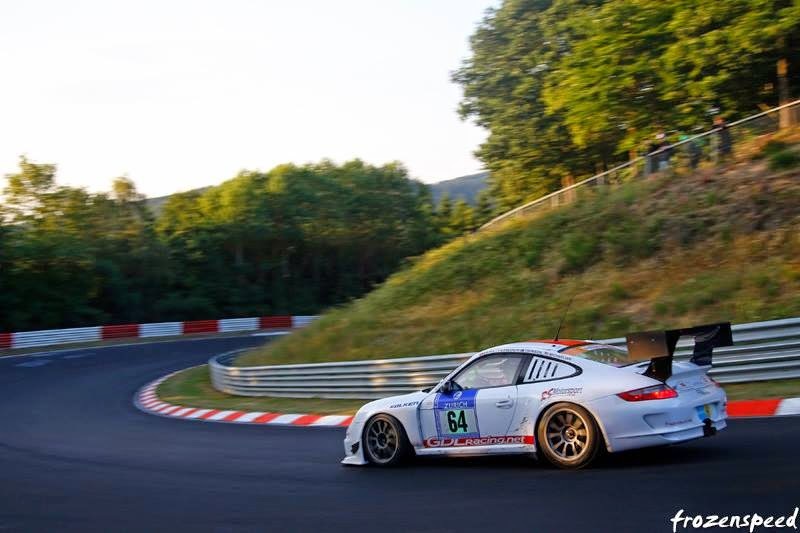 Obviously, I would be driving a Porsche again but this time a tried and true 997 GT3 Cup S. I was asked to drive by Team GDL Racing. 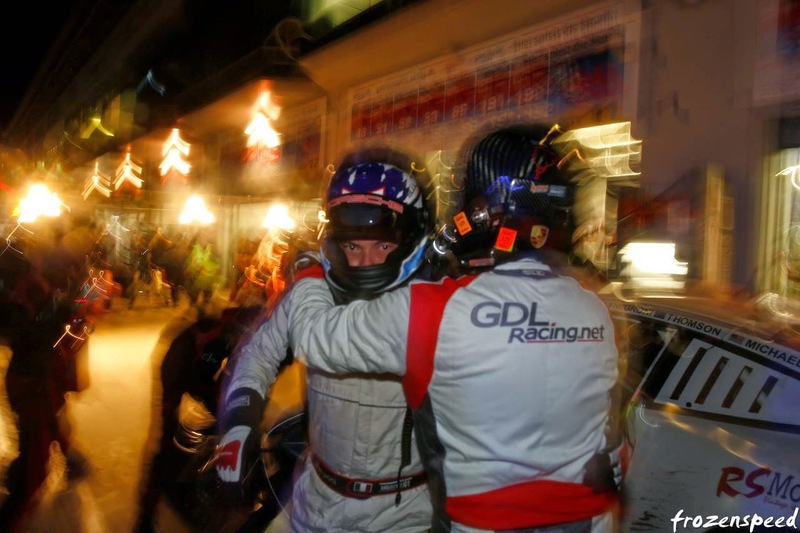 GDL Racing is an Italian team which has been concentrating on top level endurance racing abroad. 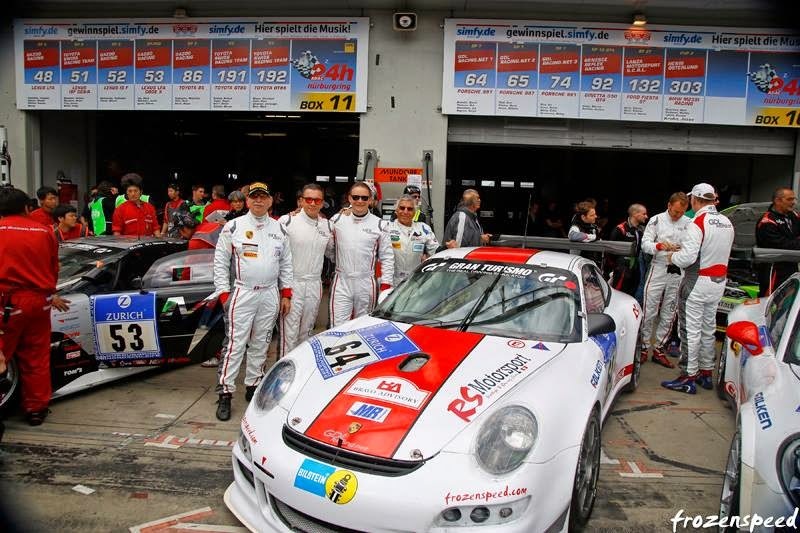 With them I had raced in the 2011 24 Hours of Spa as well as the Fun Cup 25 Hours of Spa where we came in 3rd overall and 1st in class. 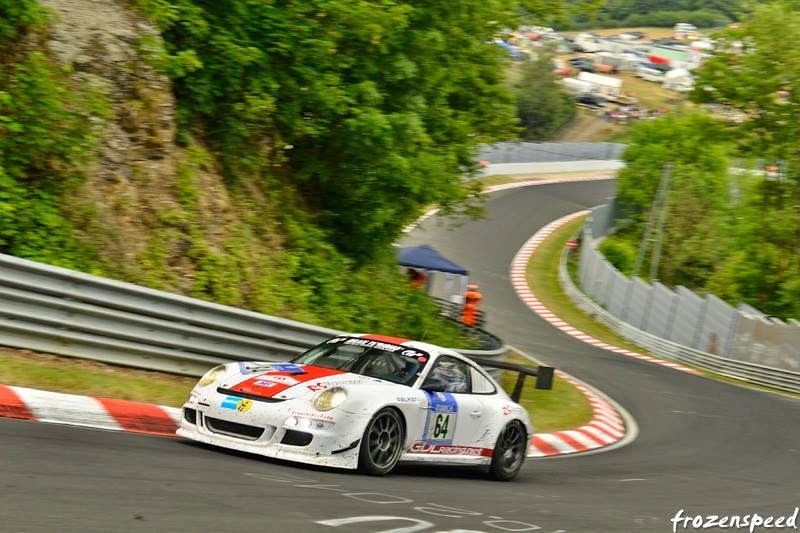 This year my co-drivers were all Nürburgring veterans: Nicola Bravetti from Switzerland, Jim Michelian from the US, Rob Thompson from Australia, all with multiple N24s under their belts. 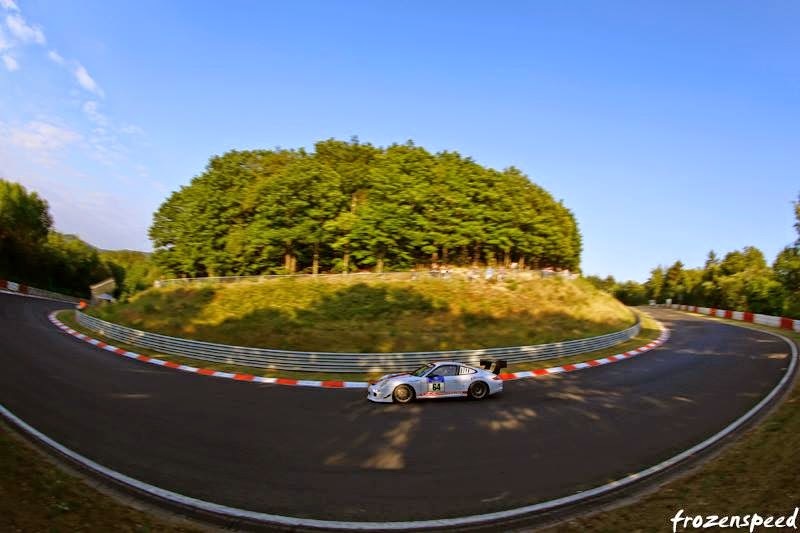 To prepare for the 24 I had earlier entered a VLN race, in a team HRT 997 GT3 Cup co driven by a cear friend and Ring specialist Kim Hauschid and Renger Van Der Zande a Mercedes development driver in DTM and IMSA Tudor LMPC. 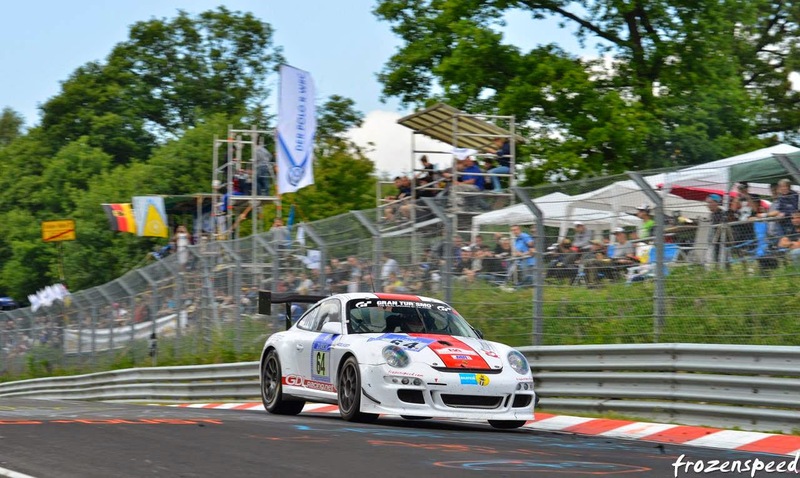 That race made it clear that too many drivers this year were treating the Nordschleife as just another track, causing dramatic accidents, both in that practice race swell as in the 24 Qualifying which was interrupted by many red flags. Any reverence towards what is the world's most dangerous track seems to have vanished and many drivers, especially in the top classes are truly taking too many risks. 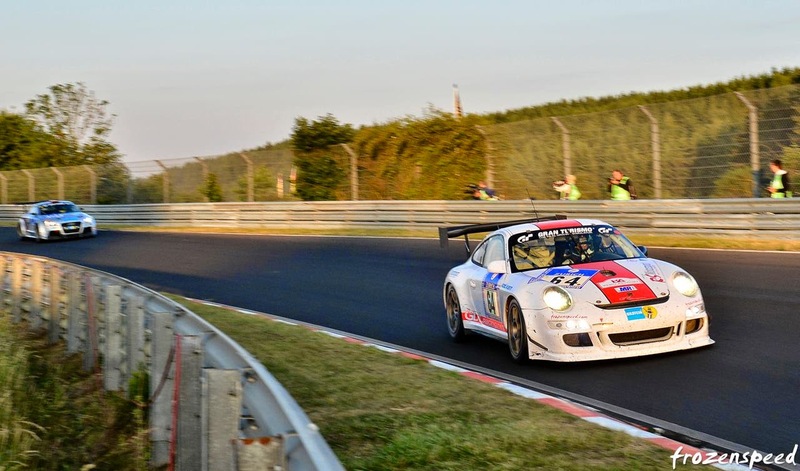 AT the drivers briefing, it was Olaf Manthey himself who took to the microphone to say that the Ring had already lost F1 and endurance racing because of too much danger, if everyone wants to keep touring cars there they should consider calming down. As an example he played an onboard video clip of a very famous professional driver cursing out anyone who would not give him way, an attitude the organizers said they would not stand for. Practice and qualifying were a bit of a disaster for us. We had setup issues and only two out of the four drivers were able to get some seat time. What's worse is those two lapped with used rubber as we were keeping the sticker tires for the night time cooler session when we hoped to set our fast lap. Rain ruined our plans. We ended up qualifying at the bottom of the first group because on top of it all we picked up a penalty for not slowing enough for a yellow flag. Race day is always a thrill, crowds swarm the starting grid and the paddock, we see old friends, kids ask for autographs and pictures. But we're focused on the race: Thompson the Australian would take the start, I had the second stint. But on lap two the car comes back into the pits, an electrical issue with the power steering was resolve in five minutes but we go a lap down, this could have to be a comeback race! After an hour and a half it's my turn. I climb in but after four laps I feel an odd vibration though the steering wheel that is getting worse. I thought it might be a tire and though the radio they ask me if I can work though it because stopping again would seriously compromise our race. Unfortunately, the vibration continued to get worse and I'm not able to lap under 10 minutes> it made no sense to continue like this, I radio that it had to be a bearing or a suspension issue, not a tire and that I would come in. Turned out a wheel had two broken spokes and the other three had cracks! After she swapped wheels, the car felt fine but man that was a close call for me. I'm in the car again at 11PM and we decided to double stint. 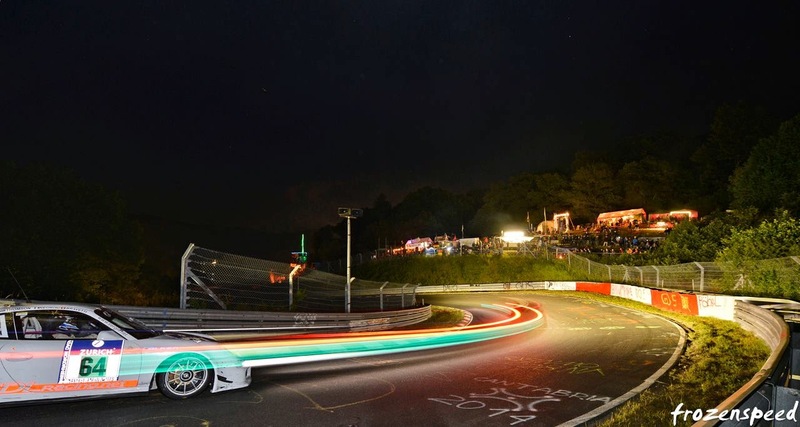 Three hours at night at the Nürburgring, the maximum allowed time for a single driver under the regulations in order to try and catch up. When I get out of the car at 2 AM, I feel fresh and rested...or so it seemed for the first few minutes until the adrenaline rush subsides and I realize how wiped out I actually am. Night passes without major dramas and I get back in at 9AM for my final stint. After 17 hours the car is still perfect. Only the water pressure light comes on often but if you know these cars you know this can happen when you add cold water quickly to a hot engine, no problem. I lap calmly at a 9:30 pace and hand the car over to my teammates in 45th position overall. We had been good at avoiding crashes during the night and lucky not to have mechanical issues.... so far. At 3:20 pm we do a final splash and go but the driver notices a drop in power, the engine will not rev properly at high RPM. There are just 15 minutes to go, maybe a frayed wire or a broken plug. Jim does a great job slowly dragging the car home on 5 cylinders. Only one regret, without those issues (power steering, broken wheel and engine trouble) which forced us to spend a total of 50 minutes in the pits, we could have completer 5 or 6 laps more and finished, rather than 59th overall, probably 33rd to 35th. That would have been a very respectable result. 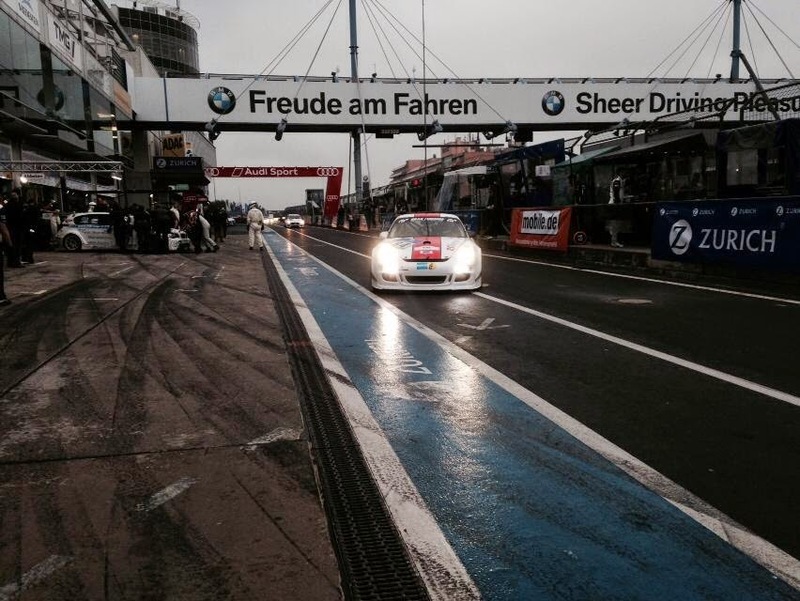 But that's motorsport, especially endurance on a track like the Ring. the unexpected always happens.